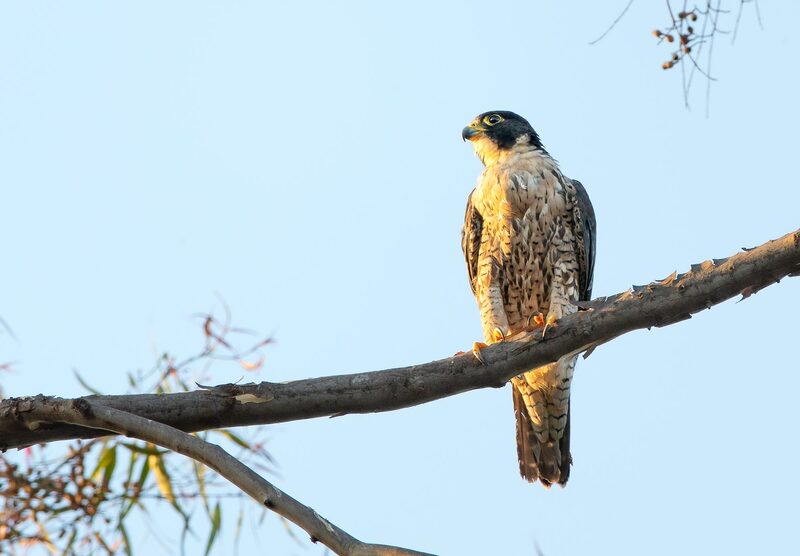 Home Explore The Naturalist's Journal Peregrine Falcon! What an amazing raptor experience we had in the garden today! During the past four years, I have seen a Peregrine Falcon only twice while in the GNG. Today a Peregrine decided to come to the yard for a hunt. After a successful high-speed stoop, the falcon brought its prey, a captured Band-tailed Pigeon, to a high perch and calmly devoured it in clear view. Nature can be brutal at times, but you can’t help but be moved by such a powerful, beautifully designed bird of prey that can do what no other animal on earth can do – catch a meal while moving at over 220 mph! Of course on this day, of all days, I wasn’t in the yard to photograph, so this drama took place without me having my camera equipment. I did my best with the situation by aligning my iPhone camera lens with my binocular’s eye piece and shot many documentation photos. Luckily the bird hung around for a while as it recovered from the hunt – long enough for Dan Gottlieb to arrive. He brought out his big Canon rig adorned with an 800mm lens and captured some wonderful images – just as the bird was bathed in magical afternoon light. As I always say, tune into nature where ever you are, what ever you’re doing – you just may find yourself in the middle of an awesome wildlife encounter!